The incredibly obscure Robert Vern DeWard was a mystery novelist from Iowa, United States, who wrote under two different pennames, "Robert Archer" and "Robert Platt," but produced only three detective novels – published by three different publishing houses. Two of his publishers were the diametrically opposites Doubleday and Phoenix Press. DeWard wrote three little-known, barely remembered detective novels, Death on the Waterfront (1941), The Swaying Corpse (1941; as by "Robert Platt") and The Case of the Vanishing Women (1943), but hardly anything is known about him except that he died in 1984 aged 90 years old. I likely would have never heard of him had one of his books not been listed by Robert Adey in Locked Room Murders (1991). Death on the Waterfront is labeled as a locked room mystery, but the story is better described as a dark, gritty and social crime novel set on the New York waterfront of the 1940s. An intriguing story depicting a struggle between longshoremen and their union with the Eastcoast Shipping company. The story begins when a "weakened, rusty cable" snaps on Pier 40 and metal bars began to rain down, "like shrapnel," which knocked out the brains of a longshoreman and wounded another – making it the third accident in as many days. Accidents caused by rotten cables, worn-out machines and overloaded slings. Fink Weller used to be the corrupt president of the Longshoremen's Union, but he was ousted along with his goons by Chris Jackson and is determined to confront John Murdock of Eastcoast Shipping. Jackson leads a delegation comprising members of the Negotiating Committee and Fat Melius, the union president, but Murdock refuses to budge. And the unsafe working environment is just the beginning of their problems. On that very same afternoon, Negotiating Committee is scheduled to negotiate a new contract with Murdock. A contract guaranteeing decent wages and safe working conditions, but Murdock prefers to sign that contract with Fink Weller and his goons. Not with Jackson and Melius. So the union members begin "the strike talk" and evidence comes to a light a labor spy is operating in their camp. A rat, or stool pigeon, who are hated on the waterfront ("some murderers are pretty decent, but I've never known a stool pigeon that was"). 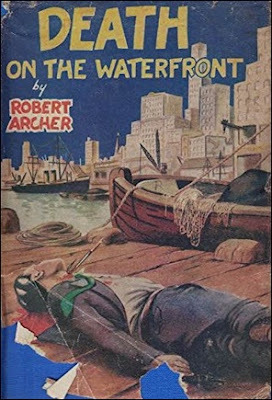 So there you have an intriguing and uncommon premise for an early 1940s detective novel, but the depiction of the grim, seedy waterfront was genuinely fascinating. A place where the sidewalks are filled with longshoremen of every nationality and Archer even mentioned two seamen from the pier of the Holland American Line "who were jabbering Dutch at each other." During the dark hours of the day, the waterfront is frequented by ragpickers, homeless bums, drunks and prostitutes. How these bottom-of-the-rung, working-class longshoremen interact makes for an engrossing read to everyone who's interested or simply likes the (social) historic aspect of the Golden Age detective story. My favorite part was the racially-laced, but friendly, banter between Colletti ("You better look out, black man. Some day thisa wop'll take you, jousta like Mussolini take Ethiopia") and Sangster ("Africa's a great big place. One day some of you little guys gonna git lost there"). About a quarter into the story, the body of a longshoreman and member of the Negotiating Committee is found dead in the back a big six-wheel cab-and-trailer-type truck with his throat with his throat ripped open "clear to his backbone" – done with a filed cargo hook. The hook belongs to Jackson and had both a motive and opportunity, because he's the only suspect with a partial or watertight alibi. So the police is hot on his heels and second murder complicates the case even further, but Jackson gets unexpected help in his hour of need. Joey Stern from the D.A. 's office is the detective of the story and is helped by two willing amateurs, Dr. Winthrop Stevenson and his niece, Miss "Blackie" Maeve O'Callighan, who helped Jackson out of a very tight spot. Dr. Stevenson is "a bug for the Bill of Rights" who has seen "too many men framed and railroaded" to "further a political career" and is determined to help Jackson. This team comprising of an attorney and two willing amateurs reminded of Craig Rice's John J. Malone, Jake Justus and Helene Brand. Who knows? Rice might have actually influenced Archer, because Stern explained in the story that his deductive abilities were bred "by Perry Mason out of Hildegarde Withers," which are two detective-characters by mystery writers closely aligned to Rice. Stern also apologized for "the implied indelicacy." 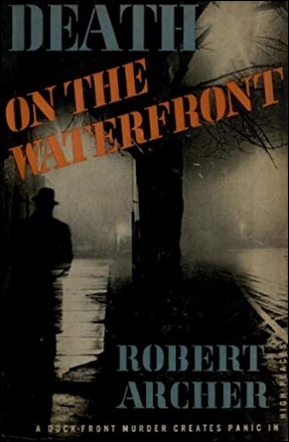 Death on the Waterfront began as a dark, moody social crime novel reminiscent of Peter Drax's High Seas Murder (1939) and George Bellairs' The Cursing Stone Murder (1954), but the plot began to resemble an old-fashioned whodunit when the murders started to happen. The second murder is even committed in an oak-paneled library with an enormous fireplace flanked by french windows. And, no, the library was not locked from the inside. The impossible murder comes very late in the story. Stern tackles these murders by a simple process of logic or, as he calls it, dialectics and interrogates all of the clues and suspects that initially pointed to Jackson as the murderer, but upon reexamination, the clues turned out to be pointing in an entirely different direction – even explaining in the final pages why the other suspects couldn't have been the murderer. Surprisingly, a good chunk of the story is concerned with the alibis and breaking a fabricated alibi is one of the main keys to the solution. The alibi-trick is not in the same league as the best by Christopher Bush, which mostly has to do with how obvious it was, but Death on the Waterfront is closer to Bush's alibi-busting novels, like The Case of the Missing Minutes (1936), than to the locked room mystery. However, there's a locked room murder in this book. 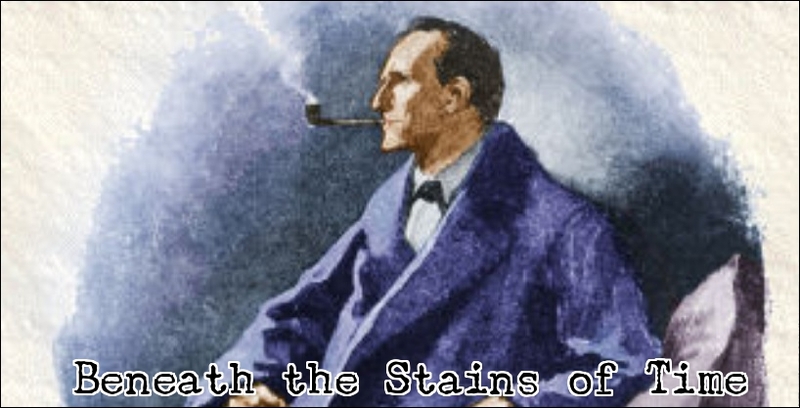 Towards the end, someone is gassed to death inside a locked apartment and having a rough idea how these old-fashioned gas-fittings work, learned from reading an unholy amount of detective fiction, I suspected how the locked room-trick could have been done. But then it was revealed that the gas meter in the basement had undisturbed cobwebs on it. So that was a nice touch to a minor locked room sub-plot and the explanation is slightly more original than the standard solution I expected, but suffers from being very dated. The locked room-trick here has the same problem as the dying message from Ellery Queen's The Tragedy of X (1932), which both hinge on, what's now, an arcane piece from history. Nonetheless, the locked room-trick wasn't too bad for relatively minor impossible crime sub-plot and its simplicity makes it even slightly terrifying. A trick that showed how easy it must have been, back then, to snuff someone out in the safety of their own home. You only needed to know about that and get to work. Death on the Waterfront is unquestionably a less than ordinary detective novel with an unusual opening showing life and work at the New York waterfront, but the plot came up slightly short with a rather obvious solution. So this is only a second-tier title from the American School of the traditional detective story. However, the background of the story still makes it recommendable, if you're interested in the social and/or historical aspects of these vintage mystery novels. Thanks for introducing me to another new to me author. Pity it wasn't a first rate tale. Perhaps those new to locked room mysteries would get more out of it, knowing less about how certain tricks could be worked? There are copies of another of his books, The case of the vanishing woman, but given your review I'm not sure I would shell out £18 for it, which seems to be the cheapest price. "Perhaps those new to locked room mysteries would get more out of it, knowing less about how certain tricks could be worked?" Absolutely. I didn't dislike the solution to the locked room problem, which was slightly different than what I expected, but readers today will find it difficult to anticipate. This impossible murder doesn't occur until late in the story. So it remains a very minor locked room novel either way you look at it. I'll give that other one a pass until a cheaper alternative comes along. The first cover is fabulous. Absolutely! And really fits the mood of the story.